Now that the dust has settled from the news of the acquisition of SMNZ by Catalyst90, we thought it would be best to cut to the chase and share our plans and reasoning behind the purchase. To break it down simply the drivers for this are around the brand that is SMNZ, the potential it has and polishing what it tried to achieve. We will be re-inspiring the blog as a destination for all things social media, we intend to widen what this is beyond the historical focus on the advertising and supporting gadgets for social media. We plan to build a web-based platform to support the New Zealand Social Media industry, from practitioners, to corporate culture change agents, recruitment to general news and reviews. We aim to use this platform to be the first place people go to find out information on Social Media, news trends and insights in the New Zealand market, in its entirety. Further to this we aim to develop a community and platform where social media success and failure is celebrated in the hope to inspire further interactions and an increase in the quality of the industry. The site has been quiet for sometime and this is about to change as we have been swamped with support and individuals from the community who are keen to write for the site, I want to encourage anyone who has an interest in the social media community to get in touch. Over the coming months Jess Bovey who is now the Editor in Chief of the site will be rolling out our plans and will be managing the content production for the ever developing blogger network. A successful photographer and the current General Manager of Catalyst90, Jess brings a wealth of experience and leadership to the role. With polished business acumen and genuine social media savvy that is matched by few, Jess the ideal individual to lead the revitalisation of the Social Media NZ brand in New Zealand. 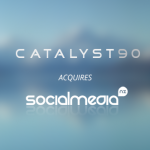 Taking up the dual role as Editor in Chief at Social Media NZ and General Manager at Catalyst90 is both an honour and a challenge. I am excited for the future of Social Media NZ and look forward to working with the many bloggers, brands and supporters of the site. Echoing the comments of Tom Reidy, I see the opportunity to create a community that supports the growth of Social Media in New Zealand. From here I will be working to establish quality content to enhance knowledge within the community. We are aiming to start gently as we ‘tidy the shop’ and re-align the brand, the platform and the network of supporters. Focusing on quality over quantity, don’t expect a deluge of content, but content that is well thought out, timely and on topic. If you’re interested in contributing or have a topic you’d like to hear about please get in touch. My vision is to have this community driven by its members and guided by the organisation. I welcome and encourage your comments and ideas! Good stuff, Jess. Looking forward to seeing more from Social Media NZ.